The conventional rod and reel combo we recommend for striped bass downrigger trolling features a conventional star drag reel with a levelwind on a 7′ medium-fast to fast rod. The levelwind is optional, but is a big advantage when making fine depth adjustments while the rod is in the rod holder. This is a very versatile conventional outfit and is perfect for nearly all downrigger fishing applications. We recommend loading the reel with 30-50lb mono which is attached to a 5ft length of 50-80lb fluorocarbon leader using a 100lb barrel swivel. The rig is completed with either custom Santini Tube lure or a 3-4oz bucktail tipped with an imitation sandworm soft bait. 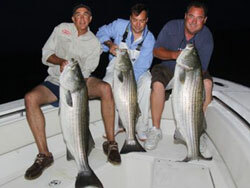 Both presentations are effective for taking big stripers in nearly any depth.